Jeff's story began back in May 1999 when he lost his hands and feet to a Step A infection. In May of 2009, Jeff became the first person in the United States to have a double hand transplant at the University of Pittsburgh Medical Center. Unfortunately, things have not worked out as he had hoped. We have had to make numerous trips back to Pittsburgh for additional surgeries, to no avail. Between all the medical expenses we have incurred sinced 1999, out-of-pocket travel expenses that we are responsible for each time we go to Pittsburgh, and the fact that Valarie takes numerous days of Leave Without Pay for these trips and to care for Jeff, we have incurred a large financial burden that continues. Now, with always another trip to Pittsburgh looming in our future, we are asking, and praying, for your support in helping to defer some of the travel and financial expenses again associated with it. We are also asking, and praying, for your support in helping to defer some of the expenses we have incurred in the past due to Jeff's original illness and are still working on. Honestly, Jeff is requiring more care at home and it is becoming more difficult for Valarie as she still is working full-time. She is eligible to retire but cannot due to the financial obligations we still have. We are grateful for any donations. Time.com has just published an article on Jeff. It can be found at Time.com. Thanks to everyone who have contributed so far. Please continue to keep Jeff in your prayers. He almost fell last week. Thankfully he didn't, but he did something to his back and hip (which is replaced.) He had great difficultly walking on his prothestics last week, so I had to take time off to stay with him. He is doing better but still dealing with the effects of this injury. Please just prayer for quick healing of all medical issues. Thanks and God Bless. I guess I should explain the picture I posted. 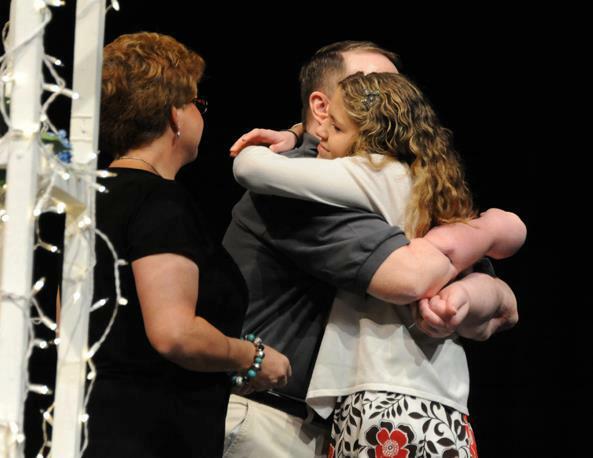 This is Jeff presenting Jordan with her class ring at her ring ceremony at the Davidson Fine Arts Magnet School during this past school year. Wish there was more I could do. I hope this helps.